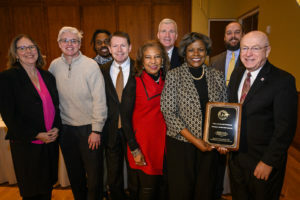 MADISON, Wis. – The University of Wisconsin System Board of Regents honored recipients of its 11th annual Diversity Awards Friday. 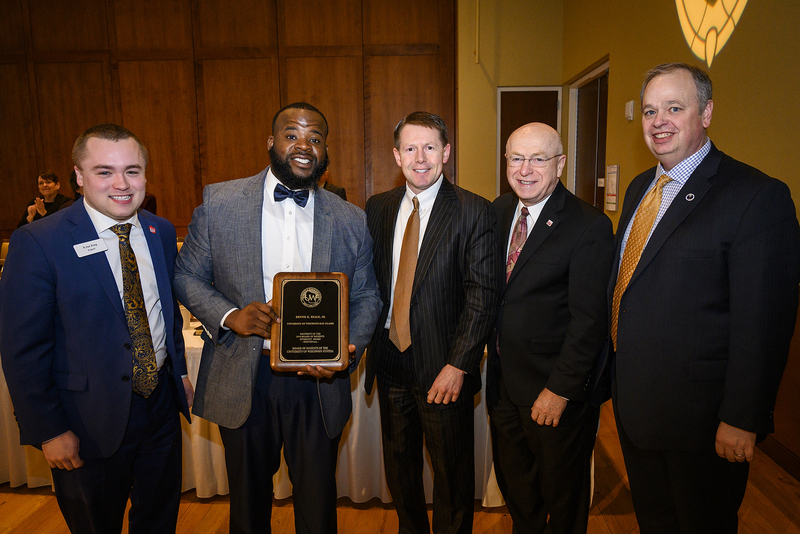 These awards recognize individuals and programs that foster access and success for students who are members of historically underrepresented populations. 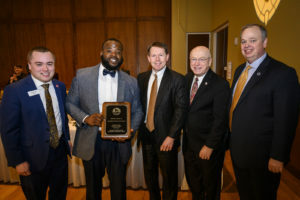 Dennis Beale accepts the Board of Regents’ 2019 Diversity Award in the individual category. A two-time alumnus of UW-Eau Claire, Beale is the assistant director of the award-winning Blugold Beginnings program, which works to make higher education possible for low-income, first-generation, and underrepresented students. He works closely with departments and units across campus to actively engage students, faculty, and staff in creating a more welcoming and inclusive campus. The UW-Milwaukee Food Center and Pantry, represented by Quincy Kissack. 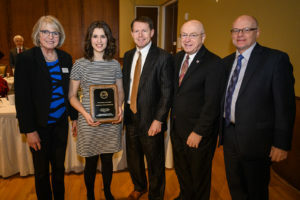 The UWM Food Center and Pantry is a collaborative effort among students, faculty, and staff to address equity issues related to hunger and food insecurity on campus. Its mission is to ensure the entire UWM community has nutritious food and key necessities in a welcoming and educational space. Members of the UW-Oshkosh Titan Advantage Program; Dr. Sylvia Carey-Butler (holding plaque) made acceptance remarks on the team’s behalf. TAP began in 2014 as a group of concerned faculty and staff on campus who were addressing the issues of recruitment, retention, and persistence to graduation of underrepresented students. TAP created the summer bridge program for incoming underrepresented, low-income, and first-generation college students to earn four to six college credits the summer prior to their first year at UW-Oshkosh. UW-Oshkosh has increased the enrollment of students of color from 11.4% in 2013 to 15.7% in 2018. Other members of the selection committee included Regent Eve Hall, Regent Cris Peterson, and Regent Ryan Ring. Chancellor Blank presents UW-Madison’s capacity-building initiatives. A key part of the UW System budget request for 2019-21 is focused on capacity-building proposals. These initiatives are designed to increase student success and output, with an emphasis on addressing the state’s workforce needs. To grow capacity will require additional investments in faculty, support staff, or facilities, to be able to enroll more students and produce more graduates in high-demand fields. “To grow capacity will require additional investments in faculty, support staff, or facilities to be able to enroll more students and produce more graduates in high-demand fields. That’s what this is all about,” said UW System President Ray Cross. He added that response from legislators to the proposals has been positive. “In fact, some have expressed interest in having us do more and do it sooner,” he said. At Friday’s Board of Regents meeting, five Chancellors – UW-Green Bay Chancellor Gary Miller, UW-Madison Chancellor Rebecca Blank, UW-Platteville Chancellor Dennis Shields, UW-Stevens Point Chancellor Bernie Patterson, and UW-Whitewater interim Chancellor Cheryl Green – provided a closer look at the initiatives being proposed by their campuses. The proposed initiatives address pressing issues such as mental health, drug abuse, and disabilities. Initiatives also focus on developing and expanding programs in high-demand fields such as computer science, engineering, business, nursing, hospitality, paper science, and aquaponics. As noted by Chancellor Blank, the institutions’ proposals prepare students to be successful and meet the needs of the state’s businesses and communities. “There’s no better way to express the Wisconsin Idea than what we’ve just heard from our Chancellors,” Cross said, following the presentation. The Board previously heard from the other eight campuses at its meetings in October and December. UW-Madison Athletic Director Barry Alvarez presents the annual NCAA Division I Athletics Report. 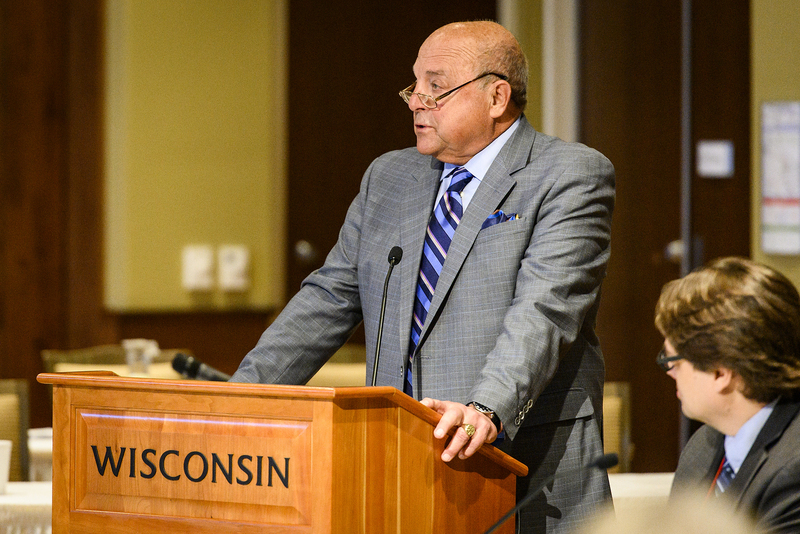 Director of Athletics Barry Alvarez led UW-Madison’s presentation of its NCAA Division I Athletics 2017-18 Annual Report. He told Regents that the program’s athletes are excelling both on the field of play and in the classroom. Eighteen of UW-Madison’s 23 sports advanced to post-season competition, Alvarez said. UW-Madison student-athletes carried a 3.12 cumulative grade-point average, he said, and between Fall 2017 and Spring 2018, a total of 280 student-athletes earned Academic Big-Ten honors. Alvarez told Regents that the Athletics Department reported no Level I or Level II violations in 2017-18. He also noted that the most recent NCAA Compliance review conducted by UW System’s Office of Internal Audits did not identify any compliance or control deficiencies. 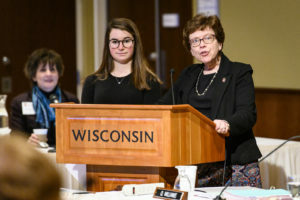 Chancellor Blank introduces UW-Madison freshman Mackenzie Straub for the February Student Spotlight. 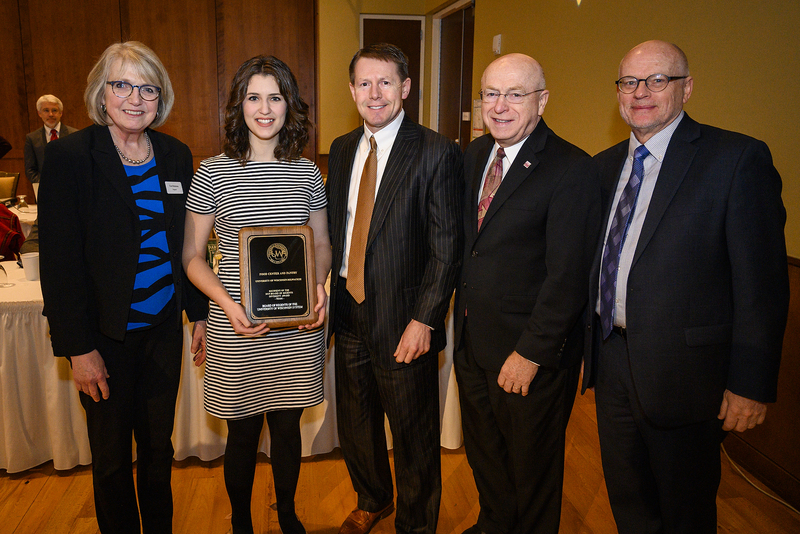 UW System President Ray Cross highlighted UW-Madison freshman Mackenzie Straub in his Student Spotlight. Straub is part of the inaugural cohort of UW-Madison students to receive free tuition as part of the Bucky’s Tuition Promise program. After her father’s death several years ago, Straub said Bucky’s Tuition Promise has made it possible for her to go to college. “I go to class looking forward to what new information I will learn and how I can apply it to my future or teach others about it,” said Straub, a native of Sister Bay, Wis., who plans to go into early childhood education. “I am excited to work with elementary schools of Wisconsin to give back to a System that has given me so much,” she said. In Cross’s News from Around the System, Regents heard that UW-Oshkosh made last fall a time for sharing and healing. Fifty years ago, 94 African-American students were arrested and expelled after demanding improved experiences for students of color. The campus invited these students to return for midyear commencement and an emotional remembrance event. Chancellor Andrew Leavitt presented Sheila Knox with an honorary doctorate and recognized other Oshkosh 94 members as Chancellor’s Medallion honorees. Cross also noted that UW System has reconvened its Federal Relations Council, after several years of inactivity. The council, which includes members of the Board of Regents, Chancellors, Provosts, Deans, faculty, students, and others representing each campus of the UW System, will discuss what’s important to institutions and how the UW System can be more proactive and coordinated in its federal relations activities. Carleen Vande Zande, UW System’s Associate Vice President for Academic Programs and Educational Innovation, provided an update on the review of the UW System’s restructuring initiative by the Higher Learning Commission (HLC). Vande Zande said HLC has noted UW System’s strong, forward-thinking leadership in proposing and implementing the plans to restructure the System, and the strong desire to maintain quality higher education for students in all regions of the state. HLC has also indicated that the Memoranda of Understanding and institutional statements clearly demonstrate the necessary criteria are being met, Vande Zande told Regents. “The team found nothing that would put the institutions at risk of falling out of compliance with HLC criteria or eligibility requirements,” she said. HLC did have some concerns about student service staffing levels, student enrollment numbers, the need for more communication strategies, and financial challenges, Vande Zande said, and these are being addressed. HLC’s report will be finalized and submitted in early spring 2019, when it will be reviewed by the Institutional Actions Committee. Approved UW-Madison’s request for authority to execute the remainder of the design contract and construct the UW managed Biochemistry Electron Microscopes project. See more photos from the February 8, 2019, meeting. 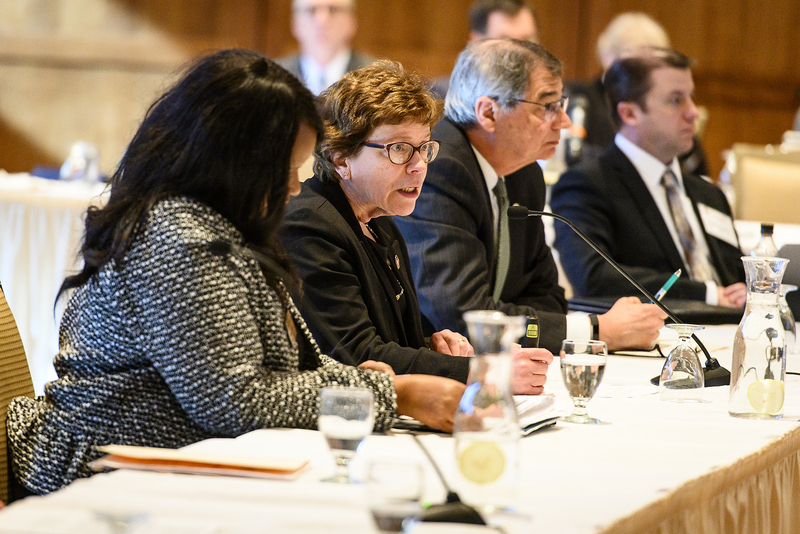 The University of Wisconsin System Board of Regents meeting will next meet on March 7, 2019, in Madison.